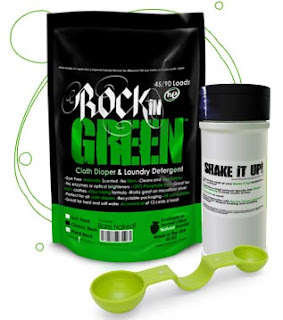 Have you entered our Rockin' Green Detergent Giveaway? Don't miss your chance to win BIG! If you're not a regular blog follower then you might have missed our Rockin' Green Detergent Giveaway post. One lucky person will win a bag of Rockin' Green, Laundry scoop & Shake It Up pail freshener, all in the scents of their choosing! Take advantage of this great opportunity! Rockin' Green is a great detergent for cloth diapering families and may just be the answer to your fluffy prayers, especially if you're having laundry issues. So head back to last Monday's post and enter for your chance to win!